Congrats to Jefferson High School Cross Country Coach Dave Howell, Edgelea Elementary Teacher Jill Howell (definitely related) and their team of volunteers for another successful year of Jeff Track Camp. It's great to see the kids get a chance to run and have fun. And, Thanks to WLFI for highlighting healthy activities for all ages. Nearly 50 kids ran, jumped and hurdled as part of a physical education program Thursday. June 27 marked the 44th annual track meet through Lafayette Jeff and the Lafayette Parks and Recreation Department. Kids ages 3 through 8 got out to "Run for Ribbons." Some of the activities included sprints, hurdles, and the high and long jumps. Coordinator Dave Howell says it's a great opportunity for kids to have fun, but also a chance to promote physical education. "They realize that running is fun. Sometimes running is used as punishment. But these kids really enjoy it and they enjoy physical education,” says Howell. Thursday marked the end of three weeks for the program. Howell says the older kids will have their annual track meet Friday. Even with heavy road and utility construction in the area and having to share the field and track area with soccer, the annual Jeff HS Cross Country fundraiser was held tonight. There was a tidy little group of runners lead by contingent from the Cross Country teams. And, thank goodness, the clouds gave just enough of a break from the sun and heat. A great job to all who ran. Purdue Half Marathon & 5K Training Programs !!! When: Training will take place over 12 weeks. Where: A weekly group run will originate from various and alternating park locations including: the Lilly Nature Center/Celery Bog, Happy Hollow Park and Tapawingo Park. This training program, targeted towards the 2013 Purdue Half Marathon, will provide the beginner and intermediate runner, under the direction of a certified coach, the training and tactics needed to complete the 13.1 mile distance of a half-marathon. Further, participants can also expect weekly delivered training plans for the duration of the program, a weekly group run with hydration support and nutrition support a technical shirt along with support and encouragement from training organizers and fellow participants. Registration: Complete a standard Parks & Recreation activity registration form, indicating Half Marathon Training under the “Class” category. The form is available online at the Parks & Recreation Department website as well as at the Parks & Recreation office and the summer program booklet. Deliver the completed form and the registration fee to: West Lafayette Parks & Recreation, 1101 Kalberer Road, West Lafayette, IN 47906. 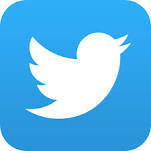 The form may be delivered via US Mail, Drop Box or Walk-In. Also, registrants may phone in the information during regular business hours and register via the use of a debit or credit card. Park & Recreation Office, 765-775-5110, Morton Center 765-775-5120. The information form can be downloaded here. When: Training will take place over 6 weeks. This training program, targeted towards the 5K event associated with the 2013 Purdue Half Marathon, will provide the beginning runner, under the direction of a certified coach, the training and tactics needed to complete the 5K (3.1 mile) distance. Further, participants can also expect weekly delivered training plans for the duration of the program, a weekly group run with hydration support and a technical shirt along with support and encouragement from training organizers and fellow participants. 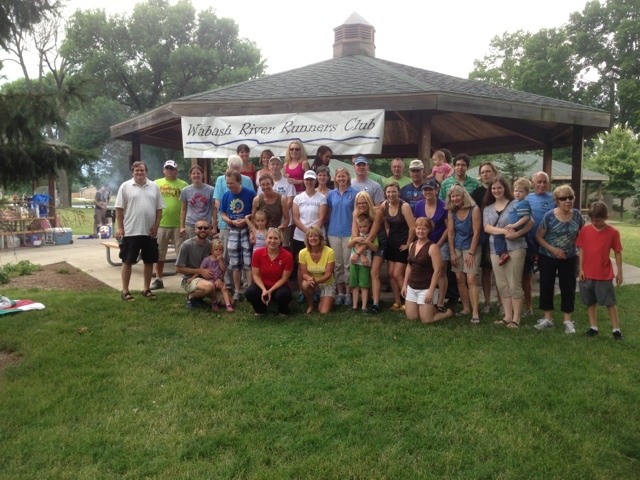 A great time was had at today's Wabash River Runners Club summer picnic. Eating healthy and getting exercise go together especially well Wednesday evening in West Lafayette. More than 140 runners came out for the monthly Farmers Market 5K, hosted by the Wabash River Runners Club. The club holds the races on the third Wednesday of every month, coinciding with the West Lafayette Farmer's Market. Organizers say the races are a way of showing support for runners in the community. 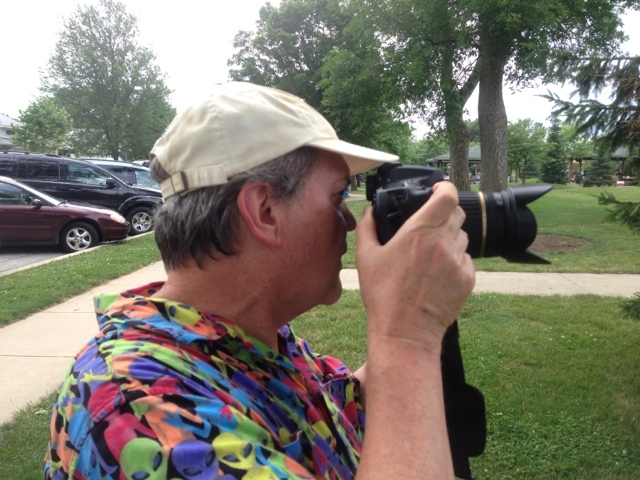 "Running can be isolating when you are training for particular events and this gives an avenue for everyone to come together," said Mark Acher, treasurer of the Wabash River Runners Club. "It's close, convenient and coincides with the farmers market." Wednesday's turnout was the highest the club has seen so far. The next race will be July 17. Registration is free for club members and $3 for non-members. During the month of July, Performance Running will be presenting a Running Fitness Camp. This program will provide student-athletes running-based fitness training during their down time between sport seasons in a fun and relaxed atmosphere. It will also provide willing and able-bodied parents and siblings the opportunity to engage in a physical activity side-by-side with their student-athletes. The program will make use of the paved trails, open fields, stairs and shade (necessary during summer afternoons) at Happy Hollow Park. See more details under the tab "Register for upcoming group classes". Check out this great article on our RRCA Indiana State Rep. Sue Brown- Nickerson. Thanks, Sue, for setting such a great coaching example! Giving back, being a role model and teaching kids how to have fun by getting involved with running is why Sue Brown-Nickerson is a Valpo Life That Matters. Brown-Nickerson has been running as far back as she can remember. 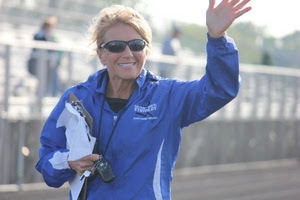 She ran track in high school forChesterton Coach Steve Kearney and now they have been reconnected coaching for CRS. Working full-time as a professional in her field, Brown-Nickerson still finds time to volunteer for CRS. From2000-2005 she was President of CRS and in 2005 Brown-Nickerson saw a need for a Youth Running Program in our area. After volunteering for AAU meets and witnessing kids coming from as far away as Fort Wayne, Bloomington, Anderson and South Bend, IN and not seeing participants locally, she did something about it. She formed the Junior Striders Youth Running Program where she has served as the Director andHead Coach. Sun protection is essential to prevent skin damage and skin cancer. 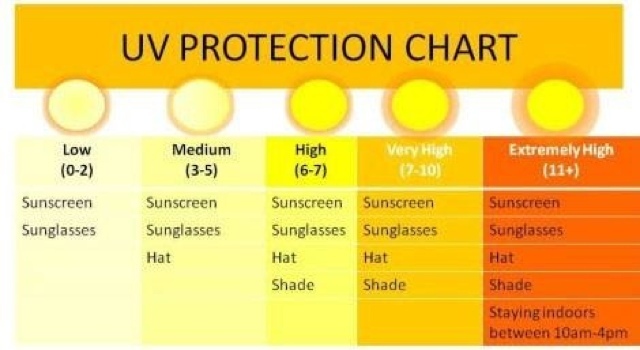 When you're shopping for sunscreen, make sure it offers UVA and UVB protection. Check to see if it's waterproof or water-resistant. A waterproof sunscreen maintains its Sun Protection Factor level after 80 minutes of exposure to water, according to the Melanoma Foundation. A water-resistant sunscreen maintains its SPF level after 40 minutes of water exposure. A sunscreen with a higher SPF doesn't necessarily mean it's better. SPF blocks the ultraviolet B rays (UVB), which cause sunburns. The SPF number on a label refers to the product's ability to block the sun's harmful rays. For example, SPF 15 sunscreen allows a user to stay in the sun 15 times longer before burning. The average time it takes a person to burn without sunscreen is about 15 to 20 minutes, according to Americanskin.org. If you wear SPF 15, you'll be protected for 300 minutes, or 5 hours (SPF 15 x 20 minutes = 300 minutes). SPF 15 blocks 93 percent of UVB rays, while SPF 30 blocks about 97 percent and SPF 45 blocks 98 percent,Skincancer.org says. Products with an even higher SPF don't offer much more protection. Remember, no matter what SPF you use, you do need to re-apply. There are endless amounts of sunscreens out there. The Active Gear Scout tested these popular products to see how well they lasted during tough runs, swims, bike rides, boot camps and daily outdoor activities. From smell to protection, here are the results. \nFind more popular products on GearUp. See the full article and product referrals here. The last thing Carl McQuay expected this weekend was to be named Indiana’s Mr. Track and Field. McQuay received the award at a banquet Friday night on the eve of the Midwest Meet of Champions in Fort Wayne. Even though McQuay earned two state championship medals at the IHSAA Boys State Track and Field meet on May 31, he was unprepared for the moment. “I wasn’t expecting to win the award,” McQuay said. “I was talking to one of my friends at the table when they called my name. I didn’t pay any attention. It feels pretty good to claim it, but it’s all because of God and hard work." Continue reading the full story here. Please consider squeezing into your busy summer schedules these running events. each supports young runners in our community. I hereby state that I am physically conditioned and prepared to participate in the Jeff 2k/4k. All risks associated with this event are assumed by the participant or his or her legal guardian as indicated with the signature below. In case of emergency, I hereby authorize the staff of the event to act for me to undertake appropriate medical steps toward the welfare of myself in any emergency requiring attention and I hereby waive and release the event staff from any and all liability or illness associated with the event. Course: ​The race will be held on the McCutcheon Cross Country Course at Wea Ridge Middle School, at 4410 S. 150 East (south 18th Street) in Lafayette. Parking will be available in the south parking lots of Wea Ridge Middle School. The course is a typical cross country course, consisting of some trails, open grassy sections, and a challenging hill. Registration:​Race day registration will begin at 7:30 a.m. and continue until 8:30 a.m.
​​​Pre-registration will be taken via mail. Please make sure any pre-registrations are postmarked by June 25th, 2012. Any registrations received after June 28th will be returned via mail. Race Time: ​The race will begin at precisely 9:07 a.m. Entry Fee:​$20 for pre-registered entrants. There will be an additional fee of $5 day of the race. For runners who do not wish to receive a t-shirt, $5 will be subtracted from the fee. Timing:​Participants will be provided with bib numbers. Event will be hand timed. Results will be provided using HyTek Race Manager. There will be post-race refreshments for participants. **Please limit one runner per form. For multiple runners, fill out multiple forms. Waiver and Release: I recognize that participation in this event may involve certain hazards. I understand that I should not participate unless medically able. I assume the risks associated with involvement including, but not limited to, falls, contact with participants, effects of weather, road and traffic conditions; these risks being unknown and appreciated by me. Having read this waiver and release, and considering the acceptance of my application, I, for myself and anyone entitled to act on my behalf, waive and release the Wea Ridge Running Club, Wea Ridge Middle School, McCutcheon High School, the Tippecanoe School Corporation, all sponsors and hosts and their representatives and successors from any claim of liability arising from my involvement in this event. I do hereby consent to the use of my name and/or photograph in connection with publicity about the race. Mary Cain does it again! One week after setting the American junior and high school record in the 800-meters, 17-year-old high school phenom Mary Cain established the American high school 5,000m record and grabbed the USA Outdoor Championships “A” standard Saturday at the Portland Track Festival. Below is an excerpt from and a link to a terrific general explainer on Lyme Disease produced by Catherine A. Hill and John F. McDonald from Purdue's Department of Entomology. This is information every trail runner should review every year. of transmission to you, your family, and your pets. The full document can be found at the following link. This WLFI.com story can be found at this link. The cloudy weather Saturday morning didn't stop some dog owners from taking their canine friends out for a little run this morning. More than 130 people came out to the 5th Annual Tails-N-Trails 5K at the Tippecanoe Amphitheatre. The event was organized by Almost Home as a way to raise awareness about the shelter and encourage people to adopt a pet. Executive Director Michelle Warren says Saturday's race is just one of the many things going on at the shelter. At midnight the organization also opened its doors for their 48 hour Midnight Madness Adopt-a-thon. "It's been fun. A lot of hours [of work] so far and we have several more to go. We are looking forward to the rest of the excitement. We're just grateful to have so many people out here with us on behalf of the animals," said Warren. This year's race helps kick off the ASPCA Rachel Ray $100,000 Challenge. That challenge runs from June 1-August 31 with the goal of saving as many animals as possible. Another race in Lafayette Saturday morning is raising donations for local Heroes. More than 75 people came out for the Run for the Red 5K /10K Saturday morning. The event is part of the Red Cross's Heroes Campaign. The campaign raises money for various veteran services around the area. Volunteer Services Director Liz Wallace says they hope to raise around $1,100 from Saturday's race. Every spring the Red Cross holds the Heroes Campaign. Wallace says the goal of the campaign is to raise $80,000. BLOOMINGTON — West Lafayette’s Bobbie Burgess thrives on the hills and wooded trails of the fall cross country season. The senior admits that running circles on synthetic tracks in the spring challenges one’s concentration. But at Saturday’s state meet at Indiana University, one of the area’s most decorated distance runners locked her focus on one runner: Mishawaka sophomore Anna Rohrer. Burgess could not catch the Caveman standout, a cross country national champion, but she managed one final milestone in a stellar career. The future Georgetown runner finished as Rohrer’s runner-up at the Robert C. Haugh Track and Field Complex. 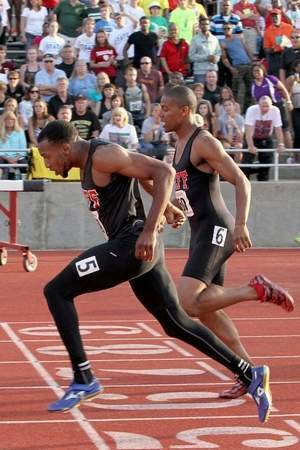 BLOOMINGTON — The anxiety preceding Friday’s boys state track and field meet churned Lafayette Jeff coach Larry Griggs’ stomach all week. What if someone on the Bronchos’ 400-meter relay team dropped a baton? What if seniors Carl McQuay and Lucas Wallace got tangled up while elbowing each other down the stretch in the 200? 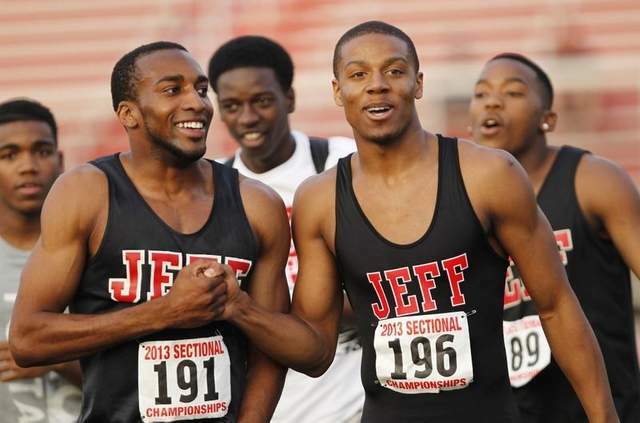 It wasn’t until after Lafayette Jeff’s second state championship of the night — the result of a flawless, record-setting run by that 400 relay — that Griggs stopped shaking. Behind three state championships and six total medal-winning performances, the Bronchos were the 2013 state runner-up at Indiana’s Robert C. Haugh Track and Field Complex. Sitting at Star City Coffee & Ale House with a book, Bryce Carlson was taking a break from running. 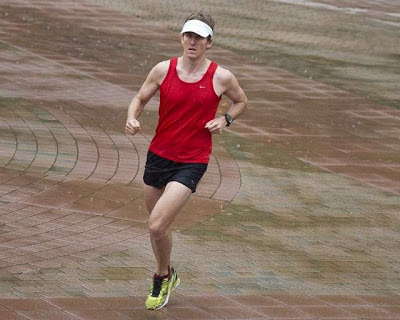 An avid runner, his first marathon was the Chicago Marathon in 2004. He did several more after that. Then he started doing longer distances — 50K, 50 miles or even 100 miles. He ran races that were timed — 8 hours or 24 hours — to see just how far he could go. An assistant professor of anthropology at Purdue University, Carlson regularly ran in the late afternoon or early evening. It was the perfect time to reflect on the day and plan as he ran. But earlier this week, Carlson stopped running.